On a recent Saturday afternoon, there was a line outside of A Bathing Ape’s store on Greene Street in Manhattan’s SoHo neighborhood. There wasn’t anything special happening inside the small, narrow flagship with its well-known white-and-glass minimalist interior; no special collaboration for sale inside, either. The people in the queue—mostly guys in their teens and 20s (though there were also some women present)—told me they were simply waiting to buy an item with Bape’s signature Ape Head logo, 23 years after it first began to appear on tees and hoodies around the world. Bape, who will be at ComplexCon this November, was founded by Nigo in 1993 (he left the company in March 2013) and began as a hole-in-the-wall T-shirt shop in Tokyo’s Harajuku district. 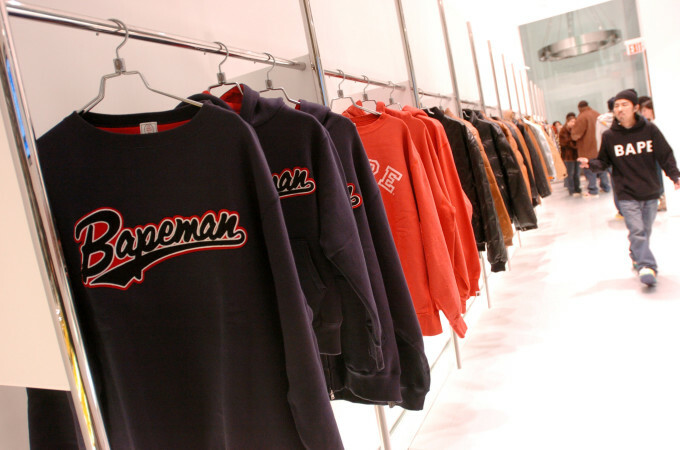 In the 2000s, it catapulted cult streetwear into the mainstream, and was co-signed by everyone from streetwear devotees to celebrities like the Clipse, Pharrell, Kid Cudi, and Jay Z. But while other streetwear brands have fallen to the wayside, more than two decades later, shoppers are still flocking to Bape. “There are few brands that have been able to stand the test of time,” says Mike Camargo, a sales and marketing consultant based in New York. Camargo began wearing Bape in 2003 and has since amassed an impressive collection that includes clothing, toilet paper, an oven mit, a clock, a bean bag chair, and more. In 2007, he customized his white Dodge Charger with black Bape interior and replaced the grill emblem with a Bape Ape Head. “It was an ignorant time in my life,” he laughs. Bape isn’t just a clothing line; it’s a lifestyle. And it’s that same idea that Camargo thinks draws plenty of fans to the brand. “Besides Polo, few brands have been able to encompass a lifestyle,” he explains. “Supreme does it, but more as a novelty. Bape knocked it out the park by making everything. Their approach to collaborations were also lifestyle based, like the Pepsi can and the MAC makeup. It was like, ‘How can we infiltrate your entire life and make it cooler?’” Bape currently sells various Bape-branded products, including towels, mugs, rugs, and more. Back in the day, Bape was only available in Japan, which meant you either needed to know someone to get your hands on an item or track some down on eBay or Rakuten, the Amazon of Japan. Customers were also limited to only one piece of any product, and it had to be in their size. That exclusivity built hype around the brand. While Bape was eventually sold at Union, and now retailers like Undefeated (also a past collaborator),RSVP Gallery, and Concepts, it’s still relatively limited. “You have to have a partnership with them just to even carry the brand,” says Alex Bruzzi, head buyer at Undefeated. Still, exclusivity and store design aside, what’s truly helped Bape stay relevant is its strong brand DNA. “It has an extremely strong aesthetic,” says Lawrence Schlossman, former Complex and Four Pins editor and current brand director at Grailed. 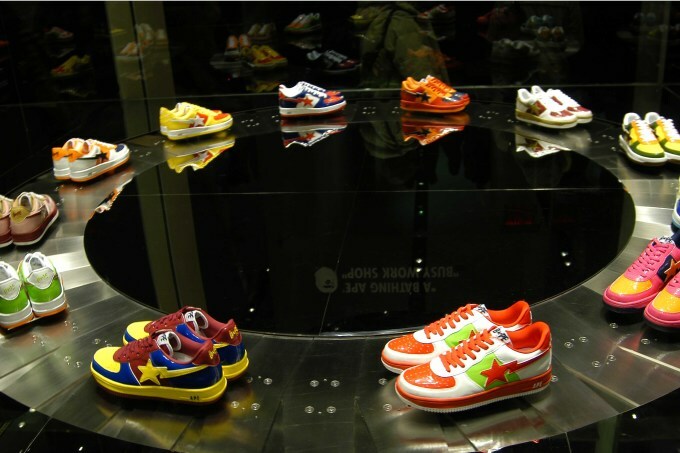 “Bape is one of those brands where if you want that Bape look, you have to go to Bape. You can’t say, ‘I want a full-zip shark hoodie. I’ll just buy it from H&M or Zara.’ You have to go to the source to get that look.” As a result, according to Schlossman, Bape is currently one of the top 15 brands bought on Grailed—next to “heavy hitters” like Saint Laurent, Supreme, Rick Owens, and Raf Simons—with pieces typically selling for just under $300. “Along with Supreme, Bape is one of the few pure streetwear brands that’s in the top upper tier of what’s sold on Grailed,” he adds.